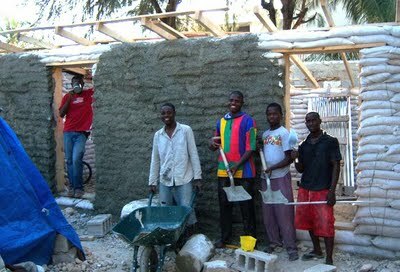 Ever since the earthquake in Haiti we have been inundated with requests for information about using earthbags for reconstruction efforts. Owen Geiger and I have joined with Patti Stouter to assemble a coherent response to this need that is based on our understanding of the strengths and weaknesses of earthbag building, coupled with some knowledge of the cultural factors involved. What has evolved is a body of information that is readily available to anyone with internet access, and can be found at www.earthbagstructures.com…a new website created just for this purpose. What you will find there are basic tutorials for building, details about how to go about choosing appropriate plans, a discussion of the cultural factors that should influence your decisions (especially for Haiti), some basic plans for emergency shelters and for more permanent housing (and some that can transition from one to the other), structural details, profiles of actual projects with pictures, a discussion of the costs involved, a listing of resources available and where training might be found, plus some technical data about testing that has been done with earthbags. In addition to this we have created a private discussion forum for those who are directly involved and want to network with others, and there is information about how to join this. Each page has a Translate Button at the top where you can choose from dozens of languages with which to read the page, including Haitian Creole. We feel that this will be a valuable resource for anyone wanting to assist people in need of shelter around the world, especially in disaster-prone regions. We expect that this website will be expanding considerably over time, as we develop more plans, construction details, and can profile more projects.